The BBC's What If? season explores visions of the future through subjects such as health, war and technology. But how did artists and dreamers from the past imagine the modern world? 1. More police officers - equipped with personal flying machines - was Punch cartoonist Charles Harrison's vision of the future. His 1901 illustration, strangely titled Increased Activity Of Police: A possibility of the very near future, came with the caption, "Now then, thirty miles an hour won't do up here! I've timed you with my aneroid barometrical check clock and you'll have to come down to the station!" 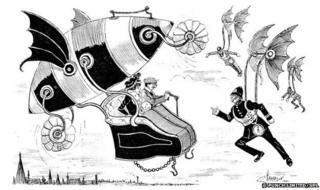 The officer's unlucky subjects were speeding in a flying machine - a popular theme explored by future-gazers. 2. Leonardo da Vinci sketched an early design for a helicopter - which he called the Aerial Screw - in the 1480s. Roughly sketched on paper, his diagram includes notes to explain how his flying machine would work. In his annotations he wrote: "I believe that if this mechanism is well made with starched linen cloth and if it is spun rapidly, the screw will... rise up high into the air." According to The National Museum of Science and Technology in Milan, the screw has a five-metre diameter and is made of reed, linen cloth and wire. His machine was never made, but Da Vinci's plan was that the shaft would be spun by four men as they stood on the central platform and pushed the bars in front of them with their hands. 3. HG Wells' time machine was one of his less successful predictions. The author and celebrated futurologist famously foresaw the creation of biological weapons, world wars and the rise of air power. But time travel remains an enduring fantasy and is constantly chewed over by scientists. Writing in the Daily Mail, Stephen Hawking explores the possibility of travelling through time in the fourth dimension through 'wormholes' in space. And New Scientist magazine regularly muses on the possibility - "don't give up yet... we are continuing to make discoveries that may show us the way forward - or back," writes one hopeful scientist. In Wells' 1895 novel The Time Machine the unnamed main character travels into distant time where he stops on a beach and is attacked by giant crabs. He also travels 30 million years into the future where the only sign of life is a black blob with tentacles. 4. The onesie predicted by author Geoffrey Hoyle was supposed to be a levelling device. In his 1972 children's book 2010: Living in the Future, Hoyle predicted that everyone would wear jumpsuits. The patterns may have varied, but the style would be universal. It was, he says, a symbol of the "restriction of liberties" - "the clothes may look odd, but they are sensible". His prediction didn't quite come to fruition in 2010, but in 2012 the grown-up romper suit staged a comeback. Thanks to reality television stars the onesie has become mainstream. Deputy PM Nick Clegg recently admitted owning a "big green onesie", while shops have reported up to a 600% rise in sales in the past 12 months. Louise Court, editor of Cosmopolitan magazine, told BBC's Newsnight that the popularity of the jumpsuit may be down to the economic environment. "It's very childlike, almost babyish," she said. "You put it on, it's nice and cosy, there's nothing to worry about, maybe it's like a security blanket. Everybody can wear one and everyone looks equally rubbish." 5. Antonio Sant'Elia's futuristic cities featured interconnected skyscrapers intersected by roads on a monumental scale. His plans were never realised, due in part to his early death in World War I. But his views and drawings continue to inspire. "Sant'Elia in his drawings has shown us the essence of the city of the future," says Joseph Kohlmaier, a senior lecturer in the history of architecture at London Metropolitan University. As a member of the Italian Futurists he is said to have co-authored the Futurist Manifesto with Filippo Tommaso Marinetti in 1914. It was an argument for speed, newness and the destruction of the old order. Nostalgia had no place. "He designed cities where you can achieve anything," adds Kohlmaier. "He wanted people to disconnect themselves from the past. No monuments, no memory architecture. "He wanted to create a flexible city organised around motion, and to do away with little neighbourhoods, creating big cities with no class, no religion, no race - like a big machine. You could say that he was a poet of architecture - an artist rather than an architect." It is thought that Ridley Scott drew on the designs for Blade Runner and in his film Metropolis, Fritz Lang's sets also feature similarities to Sant'Elia's work. 6. Fritz Lang's sleek, silver bodied Maria from his 1927 sci-fi film Metropolis raised the bar for movie robots. Built by the brilliant but mad Rotwang, the robot, played by Brigitte Helm, leads a revolt against the oppressors in a 2026 dystopia where society divided between a class of underworld workers and the "thinkers" above who control them. In real life, there are robots being designed to play an active part in fighting wars - such as fire fighting on warships and delivering supplies to besieged troops. The unmanned drone has also become a familiar part of the modern military landscape. 7. The cog-eyed droog of Anthony Burgess' 1962 novel A Clockwork Orange is a stark image of a dystopian future. Designed by David Pelham, the former art director of Penguin Books, it was drawn in one night in 1972 to coincide with the release of Stanley Kubrick's film. The illustrator who had been commissioned for the cover artwork missed the deadline. The cog-eye has become a symbol of Burgess's sinister anti-hero Alex DeLarge, a man with an insatiable appetite for violence. He is the leader of a gang of "droogs" - the name given to his friends in the book's language Nadsat - a mix of Russian and English slang. They go on nightly rampages of mayhem and "ultra-violence" fuelled by milk cocktails. DeLarge is eventually jailed for murder, during which time he undergoes an experimental aversion therapy developed by the government in an effort to solve society's crime problem - it causes him to suffer nausea whenever he contemplates an act of violence. In his memoirs, You've Had Your Time, Burgess said he was inspired to write the book by "a new British phenomenon - the violence of teenage gangs", later adding, "what I hoped for (from the film) was an expert attempt at visual futurism. Clockwork Orange, the book, had been set in a vague future which was already probably past; Kubrick had the opportunity to create a fantastic new future which, being realised in decor, could influence the present." 8. Walking on water held aloft by personal balloons was the vision of one illustrator who created a series of postcards for German chocolate company Hildebrands. The company launched the cards in 1910 depicting life as they imaged it in the year 2000. Among the images were a glass-bottomed tourist boat - their most successful prediction - as well as the less likely personal flying machine, and this one, showing people wearing skis and balloons as they go for a gentle stroll on the water. 9. The Jetsons live in the year 2062, high up in the Skypad Apartments. Set 100 years in the future at the time of the show's television debut, it features robots, flying cars and futuristic buildings raised up into the sky on an adjustable columns. The dad George Jetson commutes to work - in his office high up in the sky - in an aerocar that resembles a small spaceship. It then folds up neatly and automatically into a briefcase, which can be handily stored beside his desk. Mrs Jetson enjoys shopping and dislikes household chores, even though it only involves switching on the robotic hoover and employing Rosie, the friendly robot maid - inventions that are now coming to pass, though they have yet to make it into the mainstream. 10. Le Corbusier's plans for big cities were never fully adopted. During his 50-year career the Swiss-born architect, real name Charles-Edouard Jeanneret, attracted as much criticism as admiration. His ideas for the city of the future were dramatic and unsentimental - "they were they visions of an artist - taking the new culture of motion, progress and technology born out of the 19th century and applying it to the city on a grand scale," says Kohlmaier. Corbusier's tower blocks, such as the Unite d'Habitation in Marseilles and the one pictured, in Berlin, remain some of his most recognisable works where his ideas for cities were realised on a smaller scale. Le Corbusier developed his plan for a 'Ville Contemporaine', or Contemporary City, in 1922 as an answer to Paris' urban housing crisis, and later in his Plan Voisin and Ville Radieuse schemes from 1935. What If? is a season across BBC News looking at visions of the future. You can get involved by entering your vision of the future into the What If? competition. "He would have razed half of Paris to the ground," adds Kohlmaier. "His idea of a big city was well organised and extreme. It had a strange air of hygiene." Much like Sant'Elia, it revolved around monumental interconnected structures where work and business would take place, set in a green landscape for recreation. The traffic hub based in the middle of the city would control movement and run in and out of buildings. But his city designs never happened - his thoughts remained in books, full of drawings and collages that juxtaposed skyscrapers with images of cars, ships, ancient temples and aeroplanes. "His career spanned 50 years and he managed to realise some of his core ideas for big cities on a small scale," adds Kohlmaier. "But actually as time goes by it's as if his visions are being realised bit by bit."